A project proposal features a detailed explanation of the sequence of activities that are aimed to solve a particular problem. The document of the project proposal must logically present a clear picture of ideas that is required to be researched, the illustrations and significance of the ideas, any relatedness to past activities and expression of the activities to be involved in the proposed project. Designing a project will involve two main elements- formulation of the project and project proposal writing. 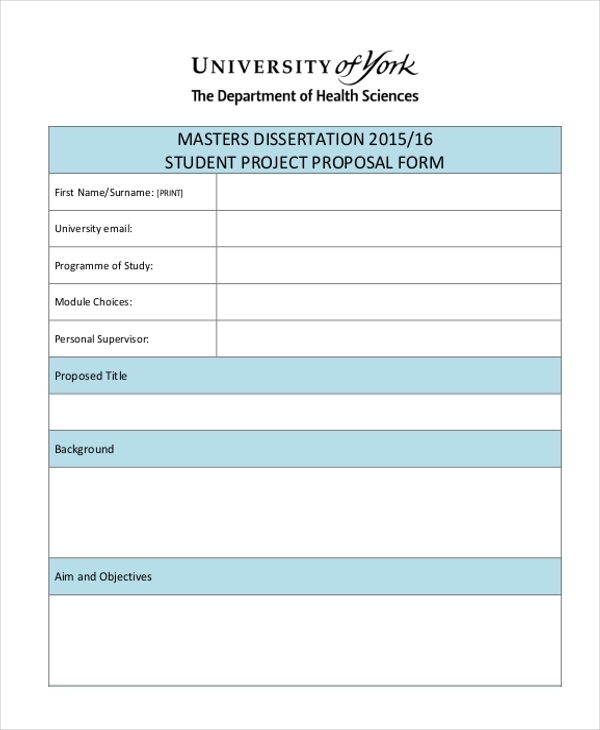 The various types of Proposal Forms are as follows. 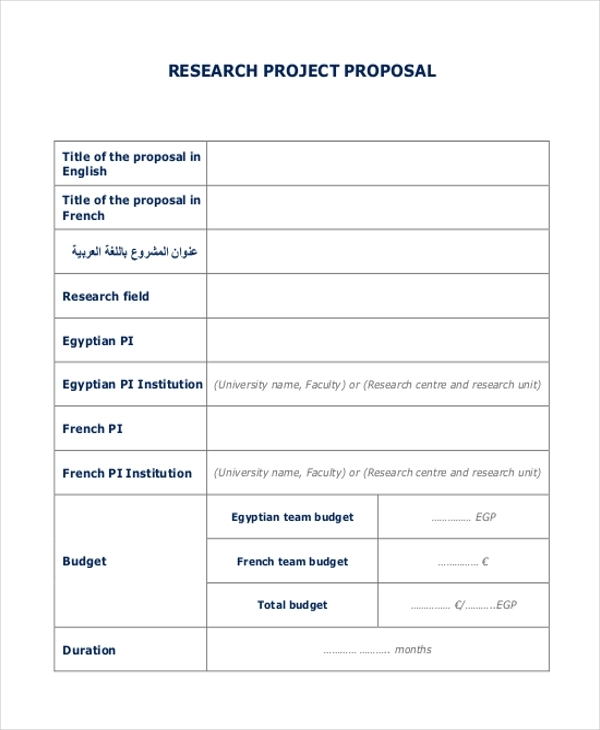 Project proposal sample is a document that guides to fill in the details of the project that you are willing to put forward. The Project Proposal Forms includes basic information about the project which includes the starting and ending date of the project and the area where the project is going to be initiated, the background of the project, associated risks, budget, and procurement of materials, sustainability, evaluation criteria, and cross-cut effects of the project. 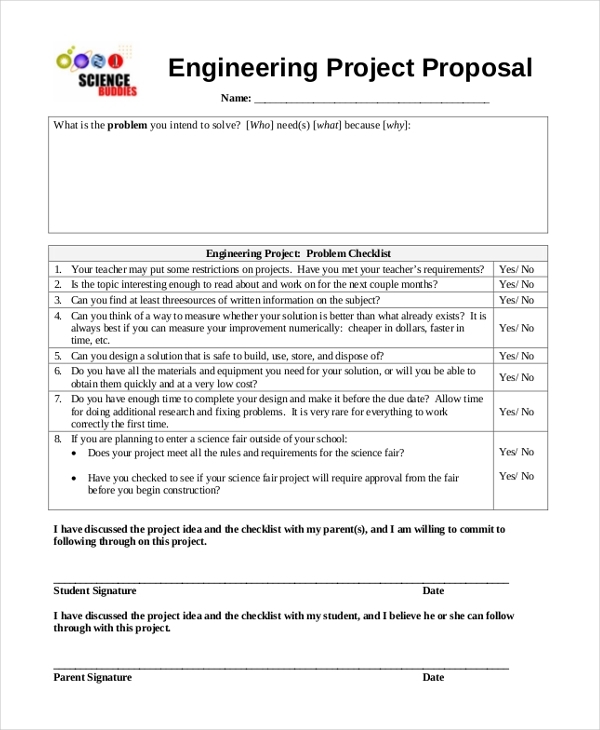 Project proposal example is a form that is filled by educational institutions, students or any person who wants to showcase a project. These are not high-cost oriented or development projects that will influence the public. These are small scale projects. The form typically expects you to fill in all the personal details and the details of the project. 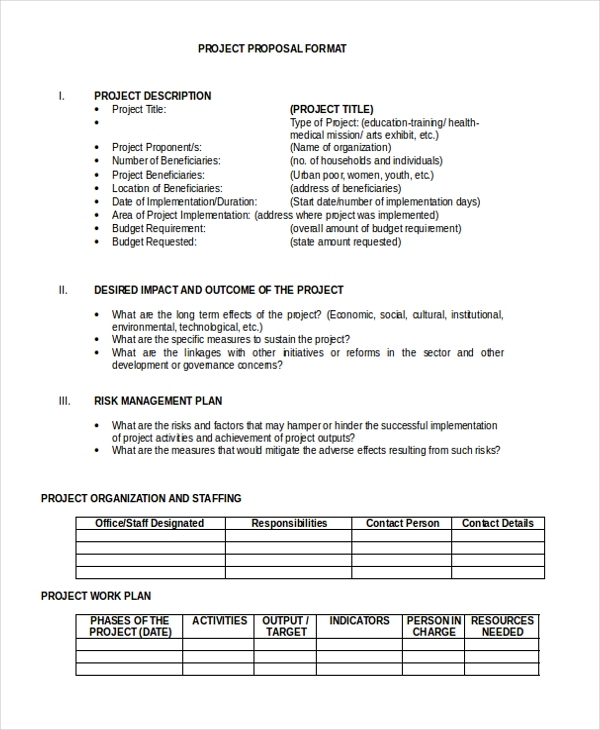 Project proposal format includes the basic description of the project, background or situational analysis of the project, objectives and strategies of the projects, desired outcome and impact of the project, management of the risks involved, staffs required, work plan, the budget description and other relevant information and attachments. Research project proposal is filled in by an individual or group who are interested in taking up a research activity. The person needs to disclose the information on the research topic, the field on which research is going to be done, the budget of the research project and the duration. You may also see Funding Proposal Forms. Project management proposal is written by a group or a team from particular business field stating details of the project they are going to handle. This letter should disclose general details about the business, income from the business, information of partners and directors, risk management, any claims associated with the business, and other additional information. As the name suggest, science fair project proposal is written by students and individuals who wish to take part in a science fest. This letter will disclose the project as they are willing to project in the fair, the budget, working and risk involved and other information related to their proposed project. 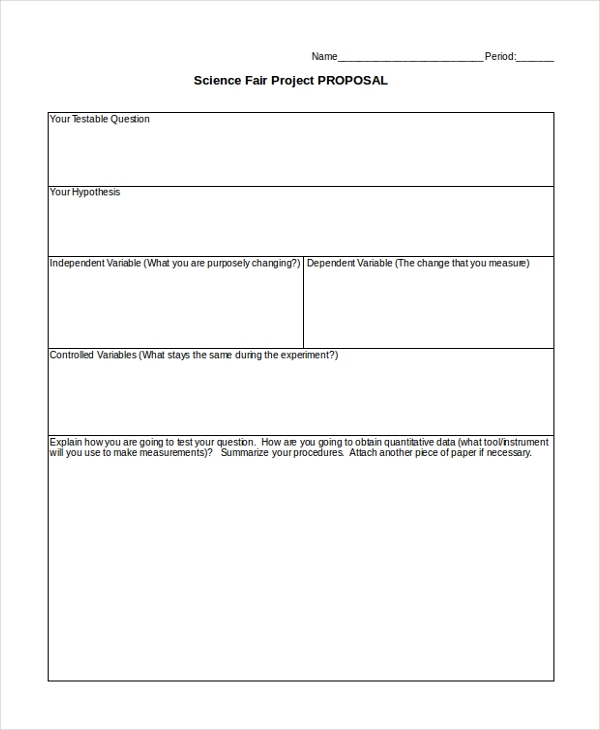 You can also see Science Fair Proposal Forms. 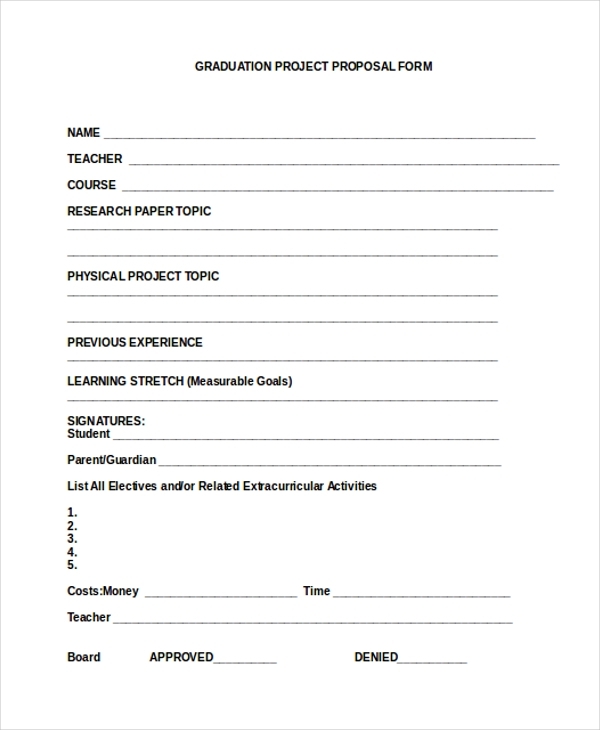 Graduation project proposal form shows the details of a student participating or handling any projects and who will be graduating in nearby future or already graduated from an educational institute and universities. The form expects the person to fill in the details of the projects and extracurricular activities, the basic detail about him/her and the teacher who guided and the money involved in the project. 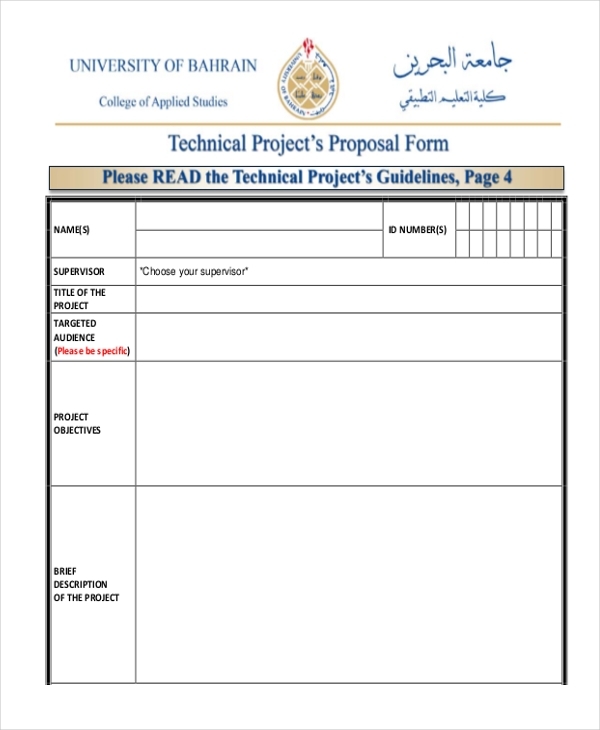 Technical project proposal forms are written by a student or any person undertaking technical projects. The form will show basic information about you and your proposed idea, the objectives and a brief description of the project. This form is typically written by students who are proposing their ideas and projects in the educational institutions and universities. 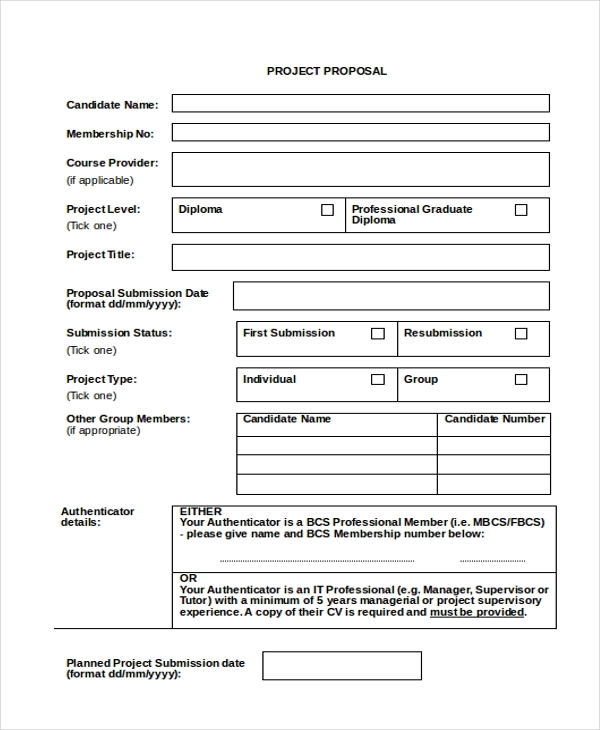 The student project proposal form will concentrate on the student’s general information like name, course name, department name and about the objectives, description of the idea and any prior experience. The engineering project proposal form deals with filing information about any kind of engineering project. The project may deal with business process re-engineering or technological evolvement. It deals with projection and presentation of yourself and the ideas that you believe will bring change. 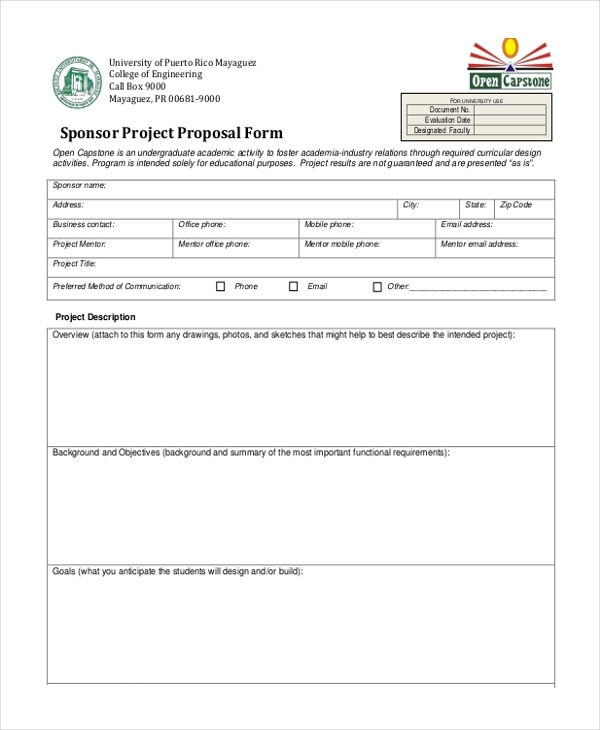 Sponsor project proposal form is filled in by people who seek sponsors for their project. This mainly concentrates on describing and impressing people to help you financially. Here you need to state all minor details of the project and your interest and schedule for bringing the ideas into reality. The proposed project forms are usually written by people working under business organizations, research students, and regular students who want to show their talents, engineers, and other people who seek to get financial help for developing and fulfilling the needs and desires of various magnitude. Also, these forms help in fulfilling both personal and professional objectives. The project proposal forms are also targeted to the government to come up with new projects and initiatives or to seek permission for undertaking any public projects. These forms can be targeted to anyone if they are the people who can assist and help you with your proposed project ideas. You can also see Business Proposal Forms. 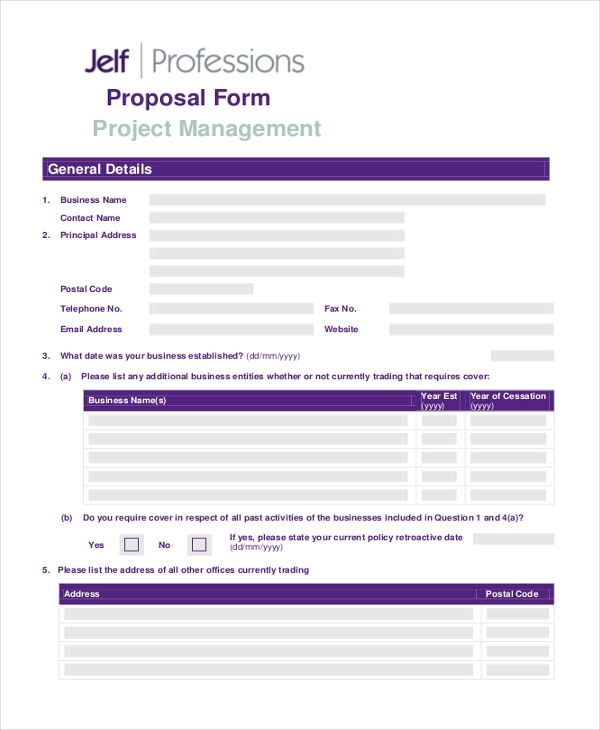 What are The Benefits of Project Proposal Forms? There are various benefits from project proposal forms. These documents act as a marketing tool and help in drawing the attention of various authorities of any degree. It helps to build a professional relationship between the employees, students, staffs and the organization. It helps in clearly stating the objectives and the usage of the proposed projects. The main intention of writing project proposal forms to various people holding authority is to express your ideas and seek permission, financial and emotional support from them. 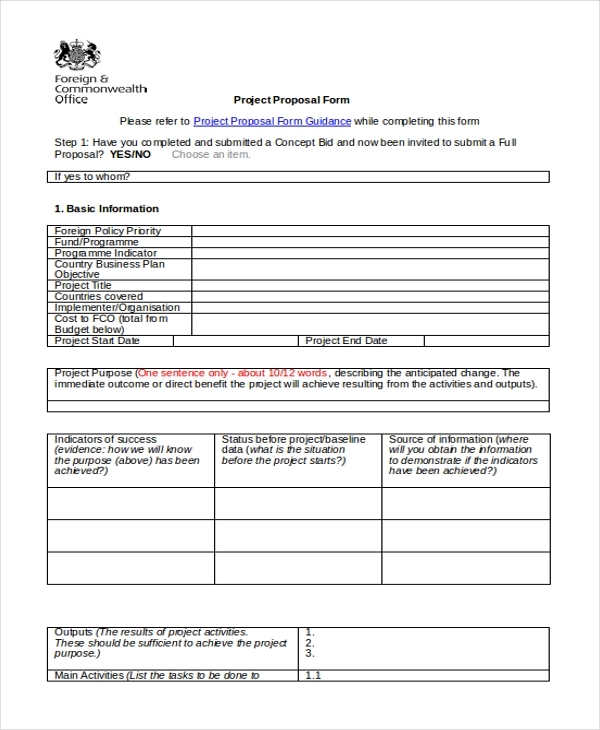 There are many types of project proposal forms addressing people belonging to various designations.There are other unique forms known as product proposal forms that speak about a particular product and its benefit. This form helps to impress people to put their money for the proposed product’s development and usage. In crisp, the project proposal forms act as a tool to spread ideas and get help from various sources for bringing the ideas into reality.